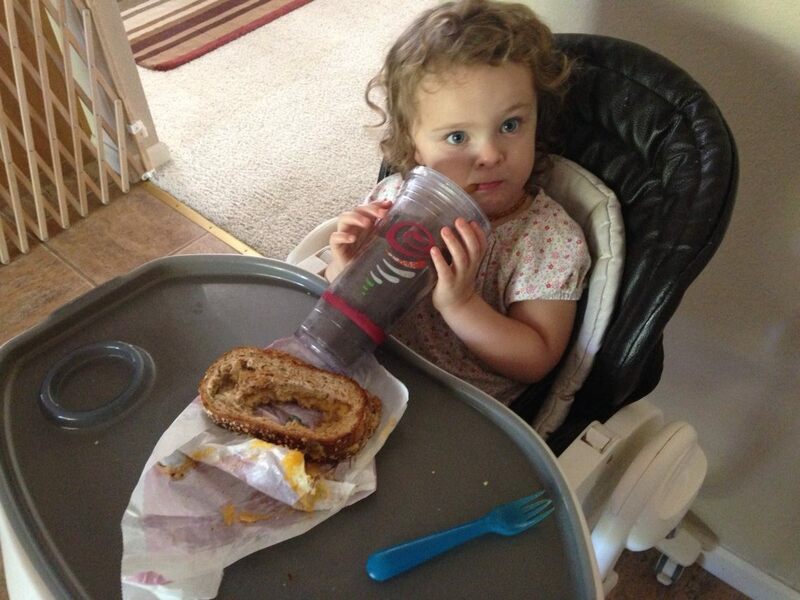 My daughter Brontë demands a fork with her grilled cheese sandwiches. She uses it to eat the inside oval only before shouting “done!” and leaving the table. She also likes to eat the insides out of quesadillas, tossing their wilted tortilla shells aside, and peels cheese off pizza slices, discarding everything else into a jumbled pizza puzzle pile. She may believe meals are mostly composed of cheese, along with a colorful assortment of throwaway garnishes. Her daily food habits suggest as much. She starts of with ample helpings of yogurt and milk, working into a cheese-related lunch and dinner, punctuated with ample cheese stick snacks in between. We had to cut her off milk after breakfast because of of her tendency to fill up on it and eat nothing else. Opening my fridge, I realize where she gets it: I see cow’s milk, goat’s milk, cottage cheese, yogurt, sour cream, creme fraiche, butter, and no less than seven different types of cheese. Ours is a house of extreme dairy tolerance. No major variety of milk product is missing. My daughter’s nonstop dairy binge doesn’t seem to cause her any suffering, however, despite the bad rap that milk has been getting lately. I’m guessing this is because while most of the world’s population is lactose intolerant, it varies a lot across ethnic backgrounds. For example, over 90 % of Asians are lactose intolerant, whereas about 82 % of Northern Europeans have a genetic mutation called “lactase persistence,” meaning they retain the ability to digest lactase into adulthood. Fun fact: the Irish are the most lactose tolerant population of all. Bring on the Irish Cheddar. Why such a vast range of dairy reactions? I’m guessing it’s a case of evolutionary pruning… Asians haven’t traditionally relied on dairy products to meet their calcium needs, so being unable to digest them wasn’t a problem. Europeans, on the other hand, have been cheesemongers for 7500 years. Ancient Egyptians, and even Sumerians, experimented with cheesemaking, but the milder European climate made preservation easier. Cheese provides Vitamin D (helpful in less sunny climates) as well as being a high-calorie food that doesn’t rot quickly (helpful during periods of food scarcity). So an exploding, lactose intolerant, belly would be a serious disadvantage throughout many centuries of glorious European cheese binging. Which brings us to today’s dairy-loaded lifestyle. Cheese probably provides far fewer advantages than it used to. We no longer live in a scarce sun environment (despite my aggressive use of sunscreen), we have plenty of other calories around, and our country’s insistence on pasteurizing dairy turns our probiotic-rich cheese supply into nothing more than calcium-laced fat. Still, it’s nice to have the option. When Brontë mines her food for its cheesy delights, she is honoring millennia of her ancestors’ culinary tastes. And also wasting a lot of damn food. Her little sister Bridget is also exhibiting some bizarre food quirks. She likes to bounce her apple a few times before eating it. I think she wants to be sure it’s dead.